Wednesday October 1st 1890 I was sewing what time I could get all day and evening Mother went to town in the afternoon and Mary Woolf and the girls stopped here on their was home from town. Thursday October 2nd 1890 The sewing girl came to work on Mothers dress. I helped with it all I could and had a little time to work on the muslin sewing and worked on it in the evening. [the following text is written vertically in the right margin of the above entry] Hattie was over. Friday October 3rd 1890 The girls came again today and nearly finished Mothers dress and fitted my red waist. Fanny was over all afternoon and she helped me with the muslin sewing. I worked in the evening. Saturday October 4th 1890 I went to town early this morning to get a tooth filled and did not get home till nearly noon. Edith came with me and after dinner We all went over to Marys awhile. I sewed all the evening. Will went to town in the evening. Sunday October 5th 1890 I was working all the forenoon about the house and getting the dinner. Mother went to church. In the afternoon Will and I drove out to Dentons. When we got back we found Ott & Fanny here. We got supper over and I read and wrote in the evening. A steady rain began at 7 O'clock. 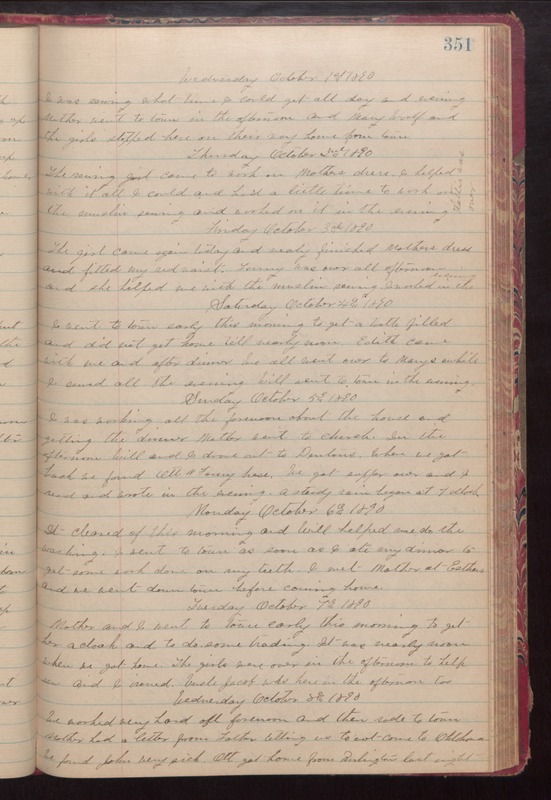 Monday October 6th 1890 It cleared of this morning and Will helped me do the washing. I went to town as soon as I ate my dinner to get some work done on my teeth. I met Mother at Esthers and we went down town before coming home. Tuesday October 7th 1890 Mother and I went to town early this morning to get her a cloak and to do some trading. It was nearly noon when we got home. The girls were over in the afternoon to help sew and I ironed. Uncle Jacob was here in the afternoon too. Wednesday October 8th 1890 We worked very hard all forenoon and then rode to town. Mother had a letter from Father telling us to not come to Oklahoma. We found John very sick. Ott got home from Burlington last night.